Co-occurring invasive plants are an understudied yet common phenomenon, and likely to become even more frequent with climate change-driven range shifts. Invasive–invasive interactions can be competitive, neutral, or facilitative; symmetric or asymmetric; and their impact on natives can be additive or non-additive. Non-additive impacts, wherein co-occurring invasives either reduce or enhance one another’s effects, have heightened implications for invasive management and native restoration. We investigated interactions among three invasive species—the legume Lotus corniculatus, the forb Cirsium arvense, and the grass Phalaris arundinacea—that co-occur in North American prairie grassland, and impacts on native prairie communities. Employing greenhouse microcosms, we observed invasive–invasive interactions by growing invasive species alone, in pairs, and in three-way combination. To assess impacts of co-occurring invasives, native prairie communities were grown with each single invader, all pairs of invaders, or all three invaders together. For insight into mechanisms of species interactions, measurements of above- and below-ground resources were made. We predicted that the invasive legume would facilitate the other invasive species via nitrogen enrichment, promoting non-additive impacts on native communities. We observed that the legume promoted yields of the other invasive species and was associated with higher soil ammonium content. However, we also observed strongly asymmetric competition between co-occurring invasive species. 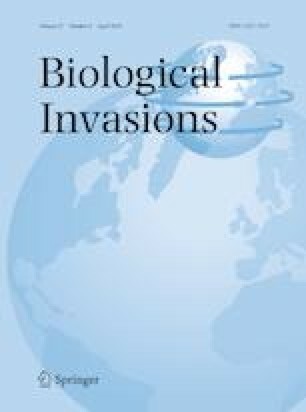 Impacts of invaders on functionally diverse native communities were similar among invasion treatments and less than expected based on invasive impacts in monoculture. These results warrant future tests of functional group identity and diversity as predictors of co-occurring invasive species interactions and impacts. The online version of this article ( https://doi.org/10.1007/s10530-019-01984-0) contains supplementary material, which is available to authorized users. Thanks to Dr. Bui Thi Kim Anh, Corben Andrews, and Maja Šljivar for assisting with data collection. Thanks to Stephanie Dickinson of the Indiana University Statistical Consulting Center and to Jay Lennon for assisting with data analysis. Thanks to the staff at Kankakee Sands Nature Conservancy Site, in particular Ted Anchor and Stuart Orr, for their guidance in regard to target species and soil collection. This research was supported by Indiana University Department of Biology funds awarded to H.L.R. and E.O.